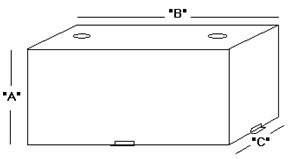 95 Gallon DOT Aluminum Combo Refueling Transfer Tank - John M. Ellsworth Co. Inc.
95 gallon aluminum refueling transfer tank designed for diesel and gasoline with toolbox. *DOT Certified for Gas , Diesel, Methanol, Kerosene, Aviation fuel and other liquids. Toolbox is 48" X 22" X 17"